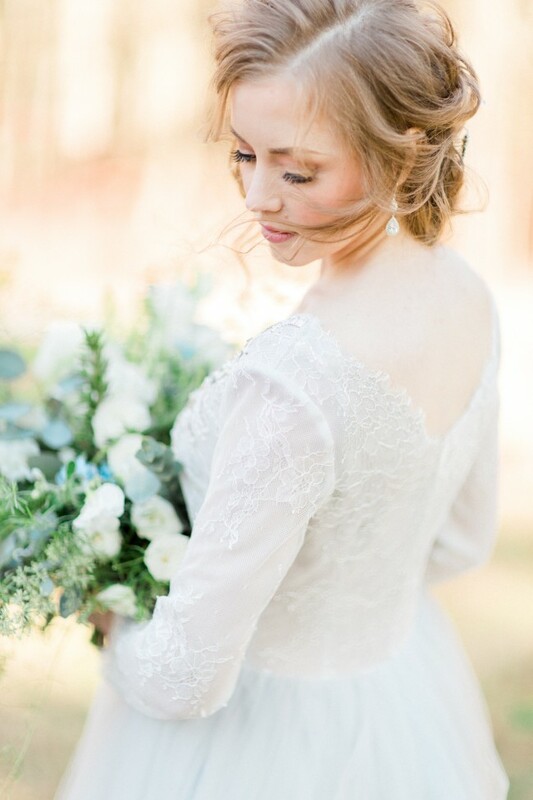 Today’s post is a sneak peek from a styled photo session! Over the weekend I sent a few items from my new collection of couture bridal accessories to a wintry blue wedding editorial. The full collection isn’t quite ready to be revealed yet (soon, I promise!) So today I’m swooning over the way Alyssa from Ginger and Blooms styled my sparkly teardrop earrings and silver crystal hair vine. 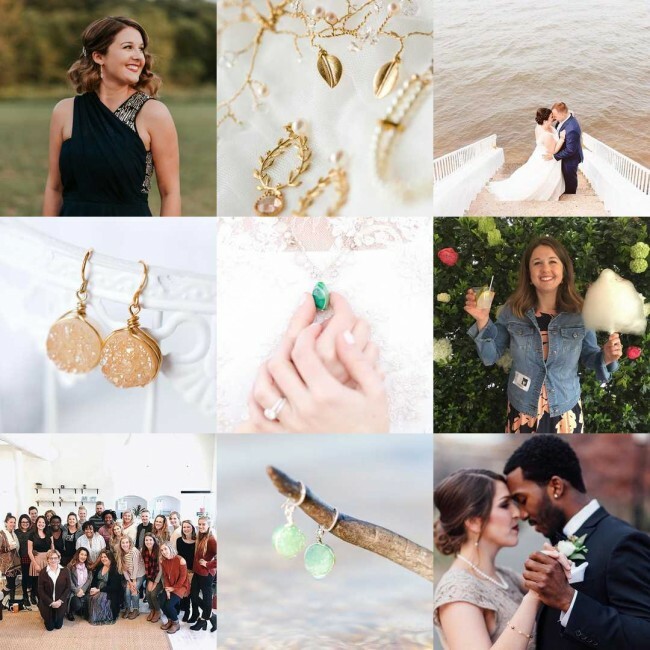 Scroll down to see the inspiration board we used for the editorial, along with a few teaser photos from Mikaela Marie Photography! 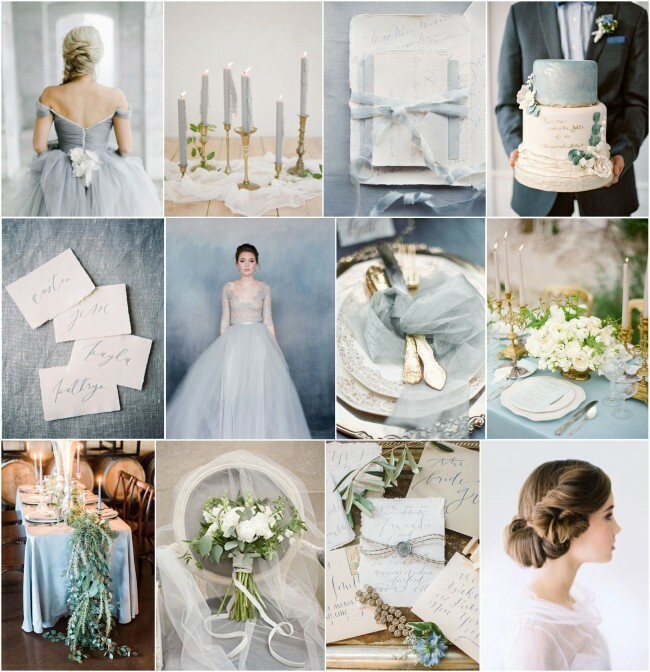 Blue wedding dresses are all the rage this season and it isn’t hard to see why! The dress we used for this photo session was designed by Mywony Bridal, a made-to-order line of wedding gowns. 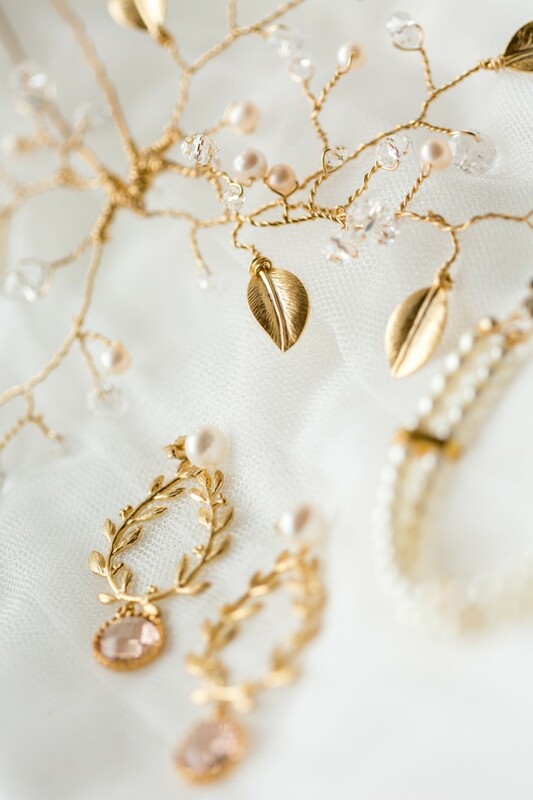 Can you imagine wearing bespoke designs for your wedding jewelry AND dress?! You can almost feel that icy breeze floating through her hair, loosely swept up in a style by Jewel Hair Design. 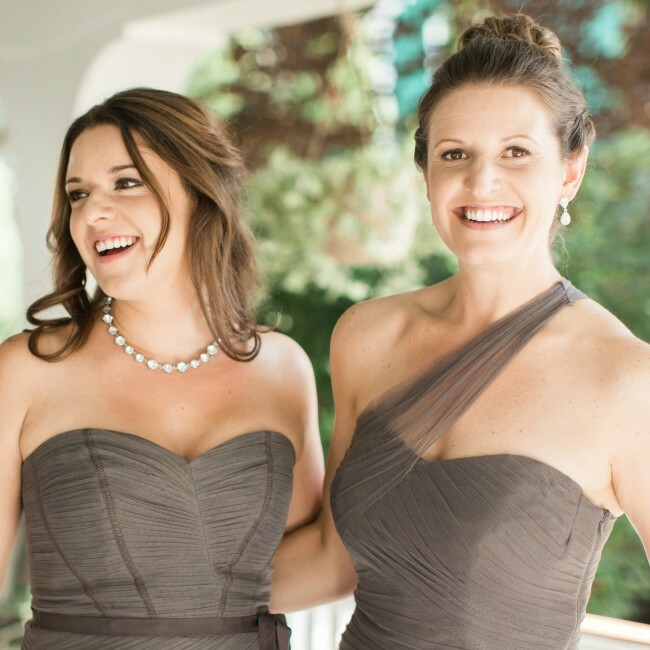 I love the way my crystal teardrop earrings are peeking out to sparkle in this picture! 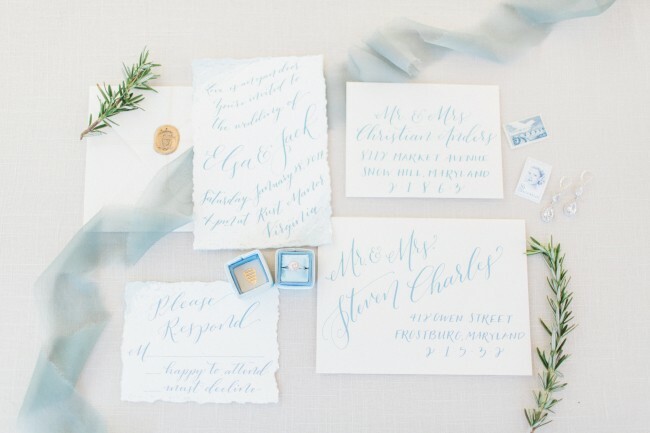 The freeform calligraphy style in these custom invitations fits in perfectly with the theme’s elegant boho feel. I love how the light blue ring box echoes the ink color, along with light blue stamps and some sparkling jewelry evocative of icicles. This might be my favorite photo from the set! Hair vines are one of the most versatile types of hair accessories because you can twist, bend, and weave them into whichever hair style you choose. 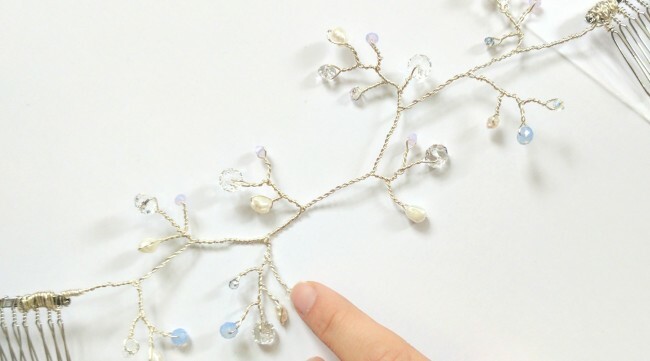 You might also consider having a custom hair vine made with crystals to match your wedding colors! Many thanks to my talented co-contributors for this editorial! I can’t wait to share more photos as they become available. And stay tuned for the big reveal of my new couture jewelry collection! It’s no secret around here that I love to make custom jewelry and accessories. I view it as the ultimate win-win situation for the client (you!) and the designer (me!). The person ordering the custom jewelry gets to have a bespoke piece of handcrafted art to wear that is 100% suited to their desires. Meanwhile, I have the satisfaction of knowing that the jewelry piece(s) I made will be immediately cherished. There’s no better feeling for a creator! 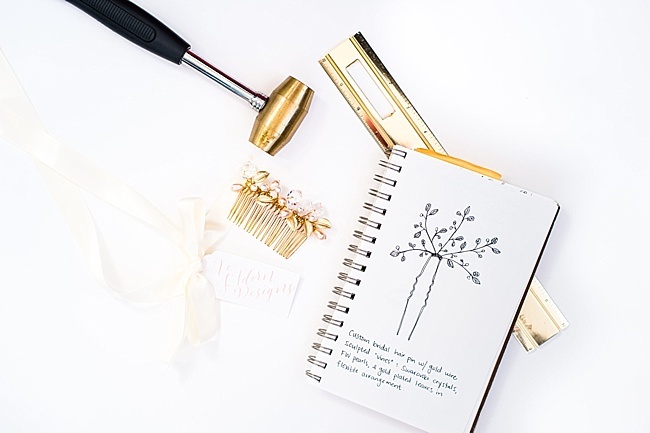 If you’ve ever wondered about how to order custom jewelry and bridal hair accessories from J’Adorn Designs, this post is for you. 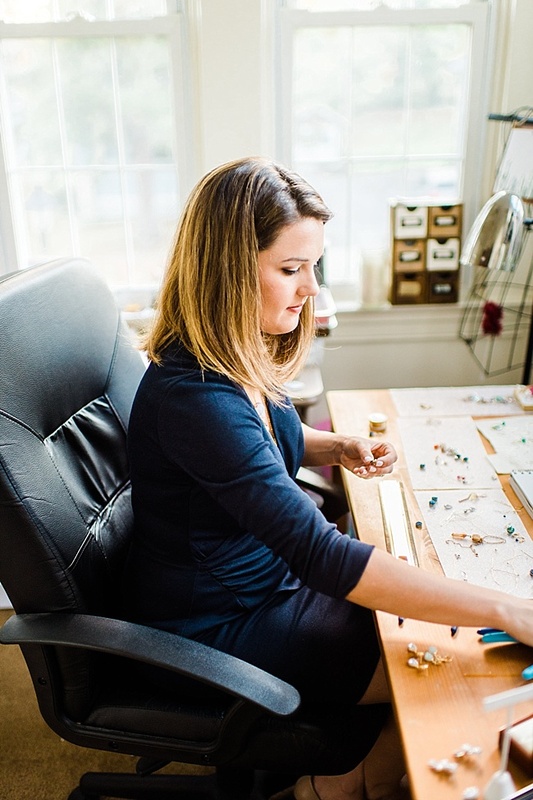 I’m going to walk through each step of the custom jewelry design process, from inquiry to gift-wrapped delivery! We’ll exchange a few messages to establish a general concept and make sure we want to work together. At this point you’ll pay an initial retainer to reserve time in my design schedule. This amount can be applied to the final balance of your custom jewelry. Next we start talking about specifics! I’ll schedule a meeting with you in person or via video chat, depending on your location & availability. You should bring any photos, color swatches, and ideas along if you have a specific or loosely conceived idea of what you want. If you’re not sure, we’ll have a conversation to figure it out together. I may draw some rough sketches during our meeting and will take copious notes. After our consultation, I’ll follow up by sending you a final sketch of the piece(s) I’m going to make and a formal proposal with price estimates. With your approval, I will send you an invoice for your order. Payment in full is due at this time. 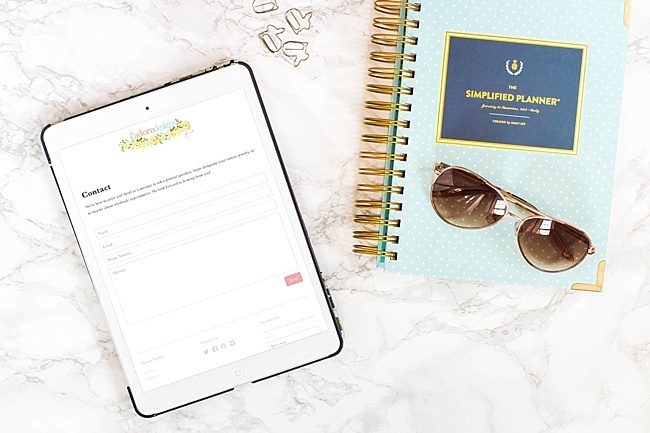 At this point, we’ve finalized the design and you’ve paid for your custom jewelry to be made. I’ll get right to work creating the accessories you’ve commissioned. All you have to do now is wait! 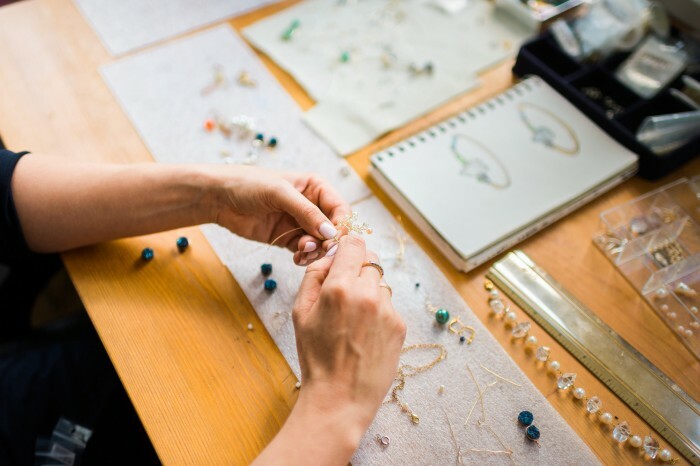 This is the most exciting part of the custom jewelry design process! Your jewelry will be delivered personally or by post, depending on your location and our agreement. 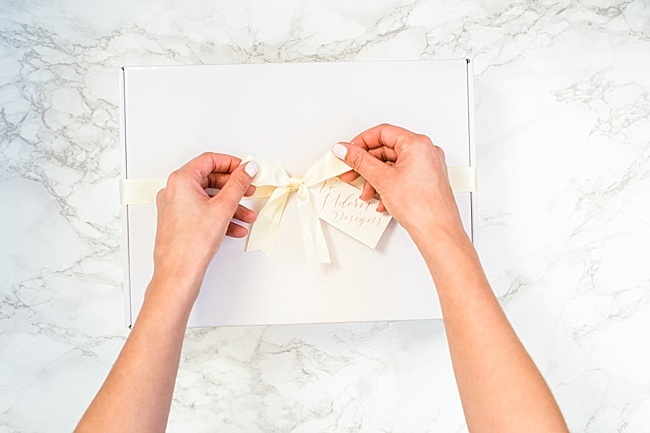 The custom accessories you ordered will be freshly wrapped in a keepsake muslin bag and gift box, then finished with a satin ribbon in the color of your choosing. Whether you ordered custom jewelry for yourself or accessories for a loved one, all that’s left to do now is enjoy it! That’s it! Ordering custom jewelry can really be that simple! Send me a quick message to begin if there’s a special piece or set of jewelry you’d like me to make. I can’t wait to get started on your custom jewelry! I am leading Tuesdays Together Catonsville, a new local chapter of The Rising Tide Society! 1. 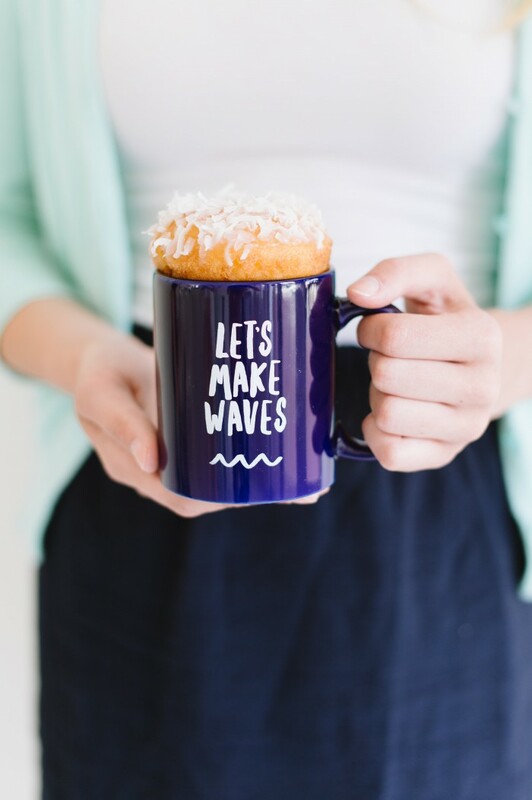 What is the Rising Tide Society? The Rising Tide Society is an international movement for creative entrepreneurs and small business owners dedicated to educating and empowering creatives to thrive in the spirit of “Community Over Competition.” A movement dedicated to the people it serves, Rising Tide Society focuses on building community locally and transforming not only the creative industry, but also the world. 2. What is Tuesdays Together? TuesdaysTogether is a meeting that occurs on the second Tuesday of every month for creative entrepreneurs and small business owners to meet in the spirit of community over competition and discuss industry-relevant topics. 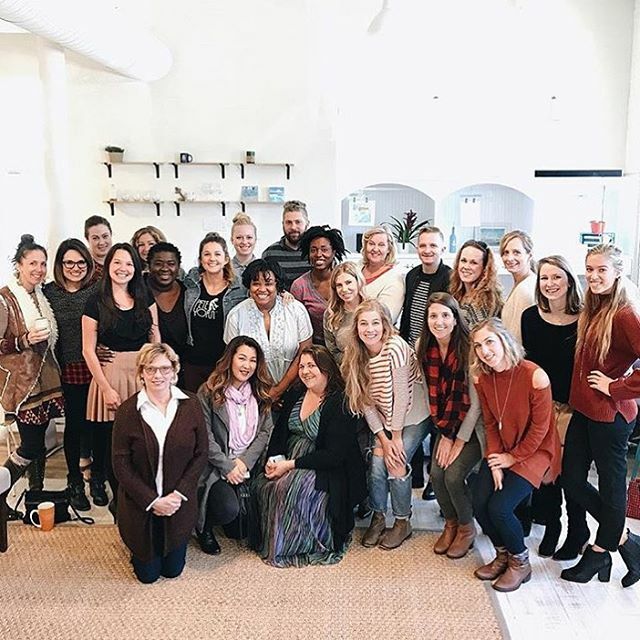 These meetings were created out of a need to connect with other people, share successes and struggles, and create long-lasting relationships with fellow creative entrepreneurs. 3. What is the purpose of Tuesdays Together Catonsville? 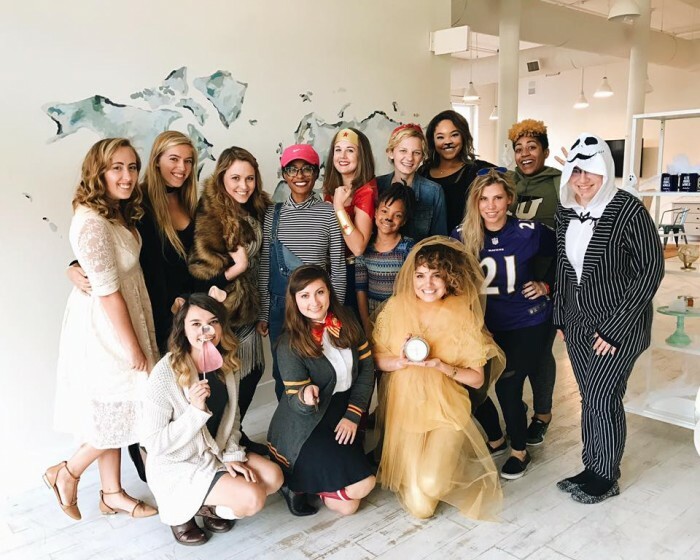 The main purpose of the Catonsville TuesdaysTogether group is to be a regular meeting place where local creative business owners can gather to support, encourage and collaborate with one another. Each month’s meeting will be geared toward a different industry-related topic. Our TuesdaysTogether group will begin meeting in February 2017 with dates and locations shared in our Facebook group each month. 4. Who is TuesdaysTogether Catonsville for? We are a society of creative entrepreneurs, men & women, from hobbyist to seasoned professional, usually gathering the second Tuesday of every month in the spirit of Community over Competition. Our meetings are open to everyone in the Catonsville area who fits this description! 5. What can I expect to happen when I come to a Tuesdays Together Catonsville meeting? You’ll likely also get a big hug from me along with a cup of coffee or glass of champagne, depending on the time of day we’re meeting! Joining is easy! Just head over to Facebook and request to join the Tuesdays Together Catonsville group. After you’ve been added, you’ll be able to participate in our online discussions. You’ll also be able to see where & when we meet each month! So whether the tools of your trade are jewelry pliers, paintbrushes, a camera, a keyboard & mouse, a pair of scissors, or your bare hands, I hope you will join me in “raising the tide” for creative entrepreneurs in the Catonsville community! Join us over on Facebook to stay up to date on group events and discussions! Most popular jewelry photos of the year! One of my very favorite projects from 2016 was the anniversary photo session that I had the chance to plan & style with A. Griffin Events to celebrate my own 5th wedding anniversary. The gallery has been submitted for publication so I can’t share too many details yet, but my style inspiration was an elegant interpretation of one of my favorite rock-n-roll music videos with a nod to the Art Deco and Art Nouveau eras. 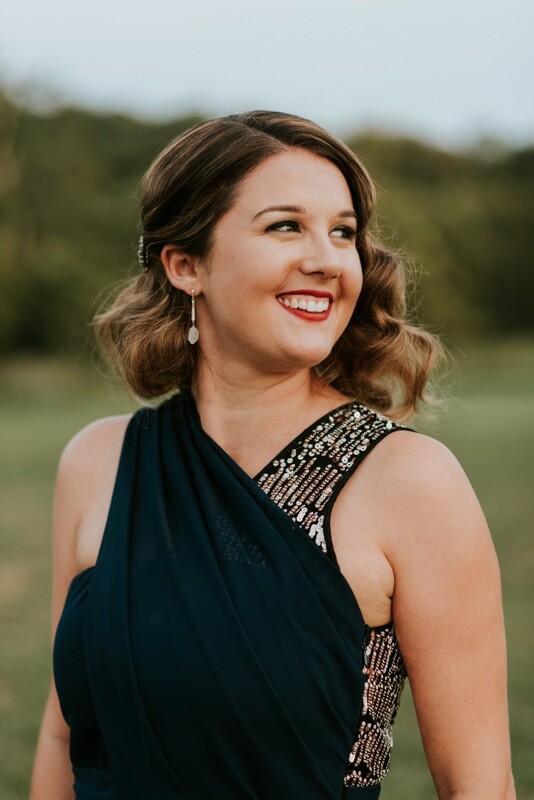 Last year broke all my previously held records for custom bridal accessories with more brides commissioning custom jewelry and hairpieces than ever before! 2016 was also the year that I added hair accessories to my lineup of modern bridal accessories, including bridal combs, flower girl clips & bobby pins, and customized bridal hairpin vines. This was one of my personal favorite sets of the year because the bohemian bride who wore it selected a combination of altered pieces from my pre-designed bridal jewelry collection and made-from-scratch custom accessories to meet her exact needs. This was another one of my favorite weddings of the year. 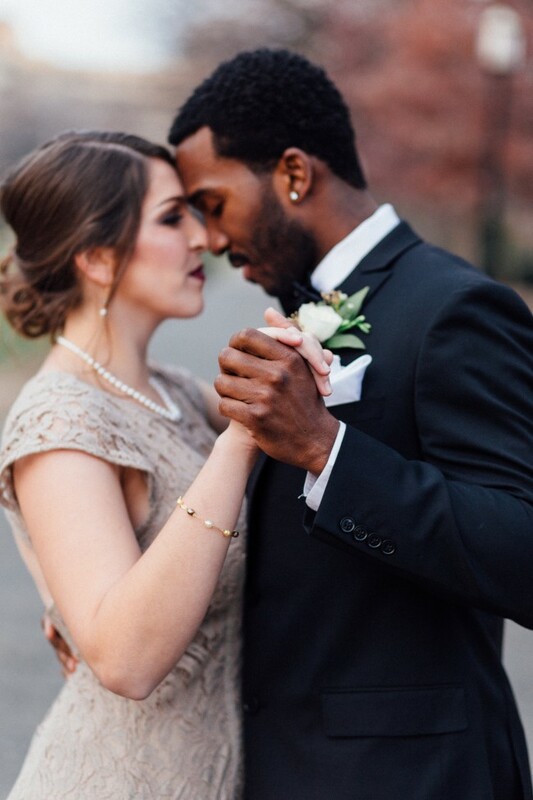 Not only because of the stunning bridal jewelry that I got to make for Olivia, but also because she and her groom, Anthony, are close friends of my family. I have known these two sweethearts since their last year of high school, and they were just as in love then as they are today! 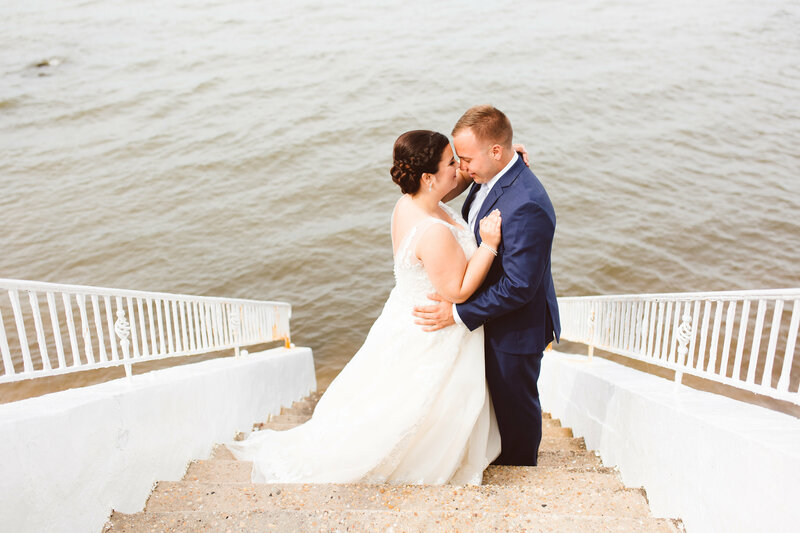 Their wedding at Celebrations at the Bay was on a beautiful summer day. We danced all into the night as these two celebrated the marriage they had been looking forward to for years. Brooke Michelle captured this intimate moment between the newly minted Mr. and Mrs. just moments after their ceremony. The joy of that moment is almost palpable. 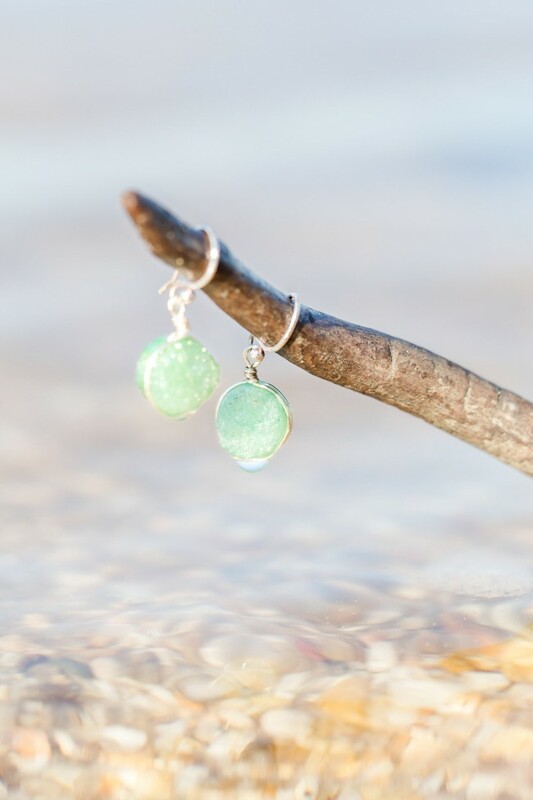 This pair of simple, sparkly gemstone earrings were in my very first bridal jewelry collection! 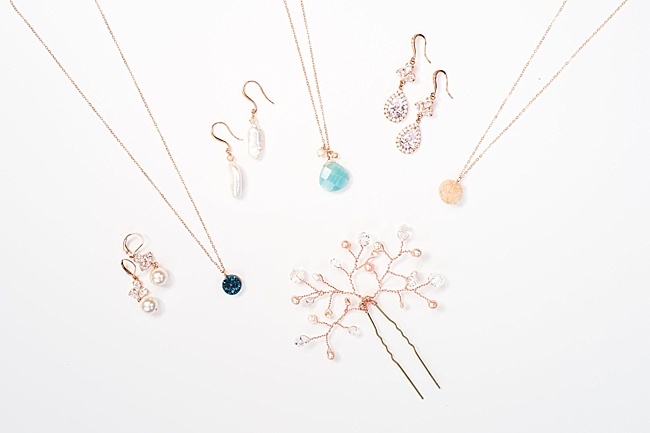 They continue to be a perennial favorite for brides, bridesmaid jewelry, holiday gifts, and stylish women of all ages. 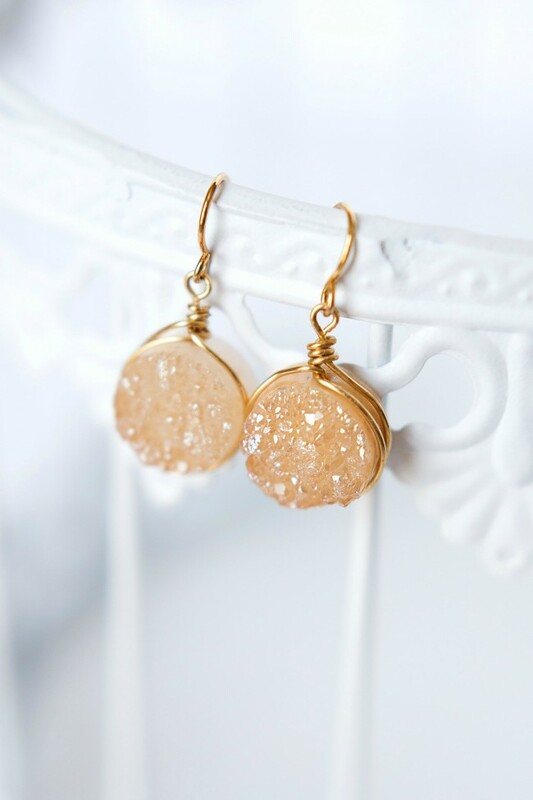 I have my own pair of these neutral druzy earrings that I wear almost every day because they match so many different outfits! This photo is one that I’ve used multiple times in my Instagram feed because it captures those crystal facets so perfectly. 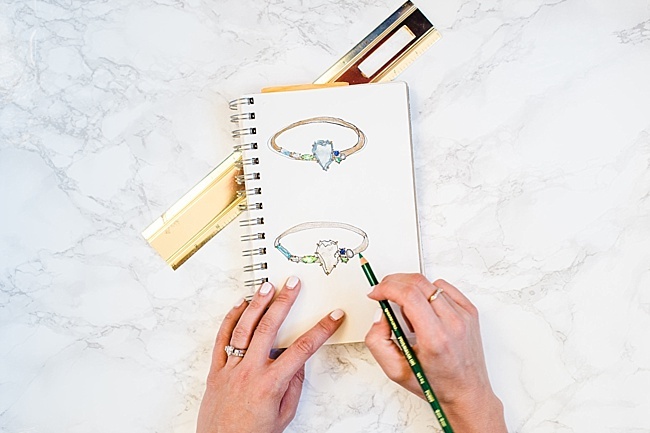 In my work as a custom and couture jewelry designer, my goal is to create jewelry that honors and reflects the most important moments and relationships in life. The accessories that I design are made to be worn, handled, gifted, and loved! This photo comes from a wedding style photo session in early 2016. I collaborated with A. Griffin Events (she’s one of my favorites!) on this cool beachy wedding editorial. 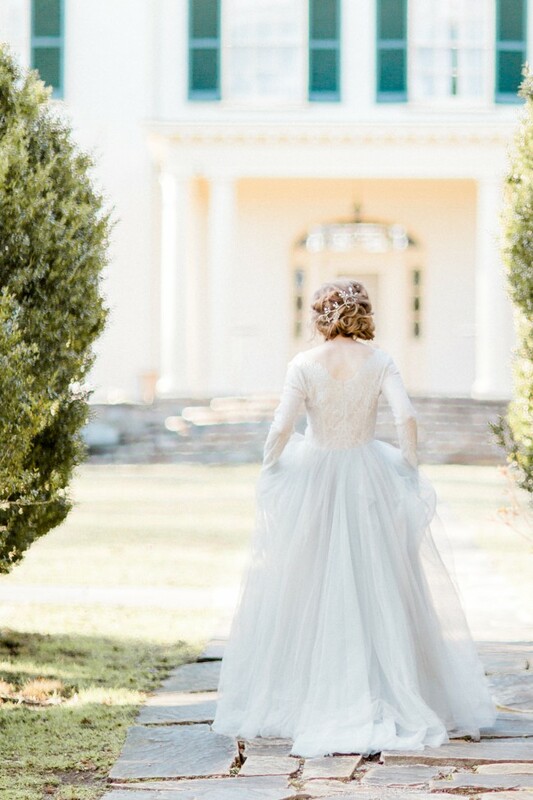 When I received the photo gallery from Lauren Werkheiser, I was simply blown away. She captured not only the beauty of this oceanic statement necklace, but the sentimentality I hope to inspire with each accessory I create. 6. 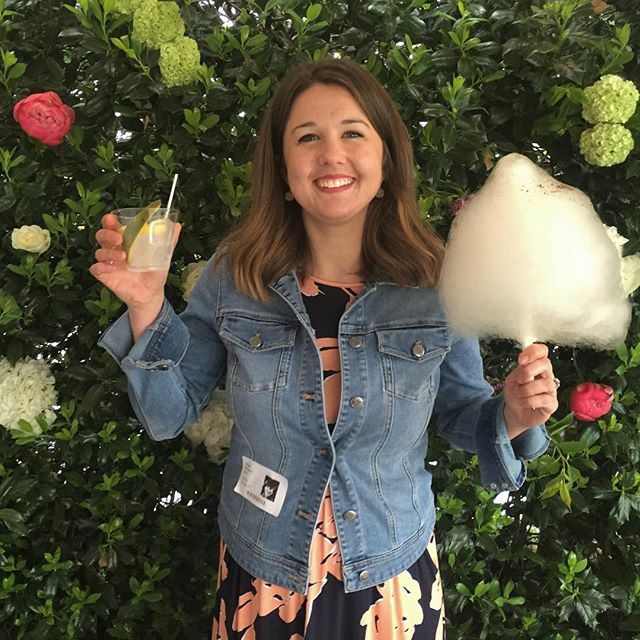 Showing My Sweet Tooth at The Bridal Event in D.C.
There’s no gentle way to put it: I am a sugar fiend. A sugar fiend who also loves cocktails! Both of these things were in abundance at The Bridal Event D.C., a unique party thrown by Grace of Bridal Bellhop and Jasmine of Jasmine Smith & Co. The Bridal Event involved a mock ceremony, a wedding photo session, and live demonstrations of all the vendors’ services who participated in the event. I had a blast at the party mingling with my industry friends and potential clients. I even got to enjoy a helping of gourmet cotton candy from Fluffness and a custom mixed cocktail from Mixin’ Mimi. What can I say? The job has its perks! 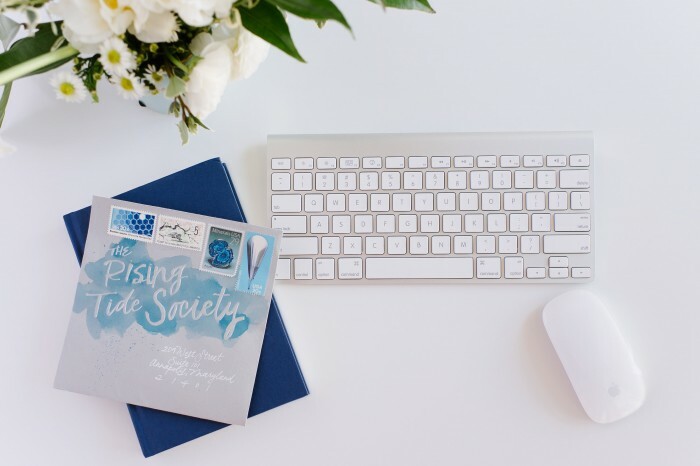 It’s no secret that I’m an active member of The Rising Tide Society, an international movement that seeks to educate, connect, and empower creative entrepreneurs in the spirit of community over competition. I attend local Tuesdays Together meetings almost every month of the year in my home state of Maryland. We took this photo at one of the monthly gatherings in Annapolis back when the organization had its headquarters on West Street downtown. This venue came to mean a lot to me during 2016 because I was lucky enough to spend a few months co-working there with RTS founder Natalie Franke and her team of genius young women. The office recently closed with RTS headquarters moving to San Francisco at the end of December, but I will never forget the sense of belonging and empowerment I received from this place and my friends who worked there for that season. This photo is another one captured by Lauren Werkheiser at the cool beachy wedding editorial from photo #5. I love the way the direct sunlight illuminates the inside of the mint green druzy gemstones along with the highlights of its facets! I came to a big realization in 2016. 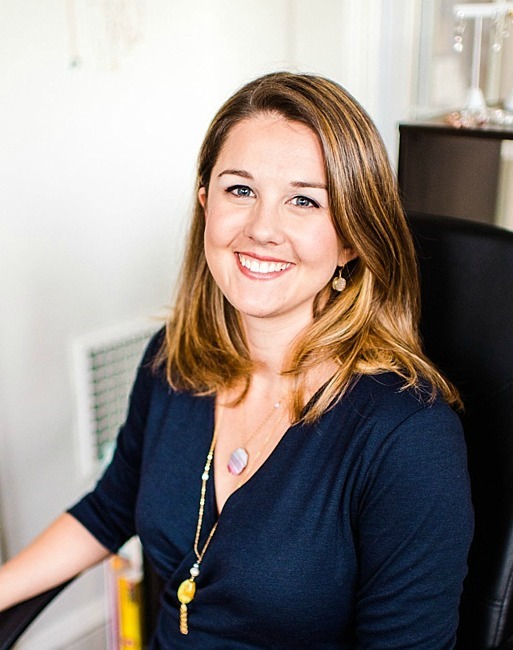 I want to use my custom and modern jewelry business to actively celebrate love in every form. It’s true that many of the handcrafted accessories in my collection are perfect for weddings and even made specifically for that purpose. But I also want to be clear that J’Adorn Designs is not exclusively for brides. Love comes in many forms, including romance but also friendship, family, and self-love. The jewelry and hair accessories that I make are meant to celebrate love in every single shape, color, gender, orientation, and type of relationship. The photo session that this image came from was inspired by the song “How Sweet It Is.” It was by far the most published editorial featuring my work this year. It’s meaningful to me because it shows the beauty, depth, and singularity of each individual love story. 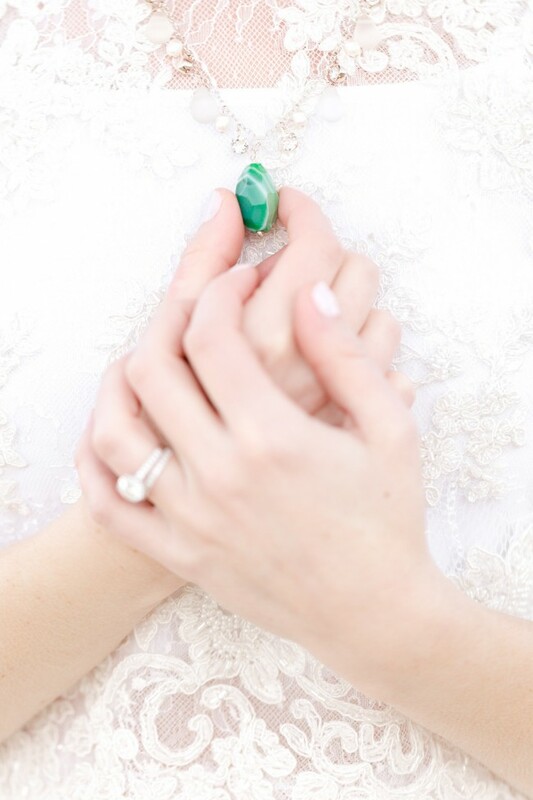 If there’s a relationship that you want to honor with a tangible keepsake that can be cherished for years, let’s talk! Raising my glass to all of your love stories and a successful new year!